A website without traffic is like a ship without a sail – it may look nice, it may be built to exacting specifications, but in the end, it’s not going anywhere. Websites exist to be used by people, and the best way to improve a website is get feedback from the people who use it. Now, it’s highly unlikely that one person would have the time or energy to sit down with every visitor and listen to their suggestions. However, there is a tool that can collect a variety of data from site visitors automatically: Google Analytics. 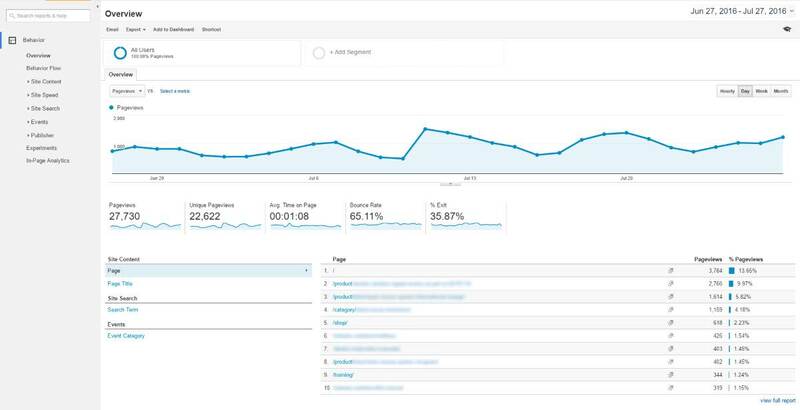 The first main section of Google Analytics is the Audience tab. This area will provide you detailed information who your visitors are, where they are located, and how they access your site. If you have a specific target audience (women from Oregon who are 40+ years of age, for example), this view will allow you to see how much your actual site audience matches your targeted audience. Conversely, if you do not have a specific audience that you are targeting, this information can give you insight into what types of people your content appeals to. If you find that 80% of your audience consists of men under the age of 25, it might be time to move away from “general” content and start tailoring your website towards this specific demographic. Knowing where your audience is concentrated geographically can be very useful. Most online advertising platforms (Adwords, Bing Ads, etc) will let you target specific geographical areas. Location data allows you to focus your advertising efforts in areas where you know your site is popular, and avoid regions where your site does not perform as well. The demographics of your audience might seem unimportant at first glance, but they can play a big role in determining the success of your site. No one is clicking on your sidebar advertisements for the latest men’s fitness program? Maybe it’s because your audience primarily consists of women. Are your retirement advice articles not getting the response you expected? Not surprising, considering 70% of your site visitors are under 25 years of age. While it might not factor as heavily into sites that appeal to the general public, it’s always a good idea to keep in mind the demographics that make up your site traffic. In addition to analyzing the people that access your website, it’s important to know the devices that are accessing it as well. Over the past decade, mobile traffic has gone from a small sliver of internet users to more than half of the online population. Having a website that displays perfectly on every device, on every screen size, and in every internet browser can be extremely challenging, and is often a long process that involves excessive design tweaks. 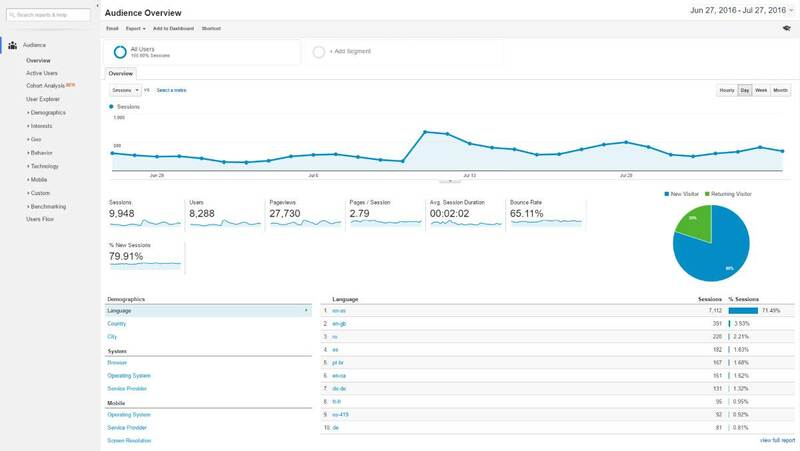 Google Analytics device information can help by providing a starting point; begin by ensuring that your website displays correctly on your audiences preferred devices and browsers. Afterwards, you can move on to the less popular ones, eventually tailoring your website to work with all of the devices that your audience prefers. The Audience Overview is useful for knowing who makes up your audience, but what if you want to know other things? How did these visitors get to your website to begin with? These types of questions will be answered by the data within the Acquisition tab. The Acquisitions Overview answers the question of where traffic comes from. There are a few main ways that users tend to arrive at a website, and where that user is coming from will often affect how they behave on the site. Search engine users are, as the name implies, searching for something. There is a specific piece of information they want, and if your website can provide it for them, they are more likely to stay on the site to learn more. Alternatively, social media users tend to be most interested in entertainment. They usually browse their feeds looking for something that catches their attention. When something does, they’ll click on it to check it out, but will likely return to their social media feed afterwards, looking for the next distraction. Analyzing where your traffic is coming from and how that traffic is performing can give you useful insights into how best to promote your website. Organic Search traffic arrives at a website via a search engine link. Monitoring organic search traffic is especially useful when it comes to gauging the effectiveness of your SEO (Search Engine Optimization) strategies. It can be difficult to validate SEO work, but if you are actively improving your website in the eyes of Google and the other search engine titans, you can expect to see a gradual increase in the amount of organic traffic that arrives at your website. If you’re not seeing this increase, then your optimizations probably aren’t having the right effect, and it’s time to re-evaluate your strategy. Paid Search is similar to Organic Search, except that the visitor followed a paid advertisement link rather than a link that appeared organically in the search engine results. If you are running search ads through AdWords or a similar service, you should expect to see paid search traffic arriving at your site. While this information is not as useful on its own, comparing paid search traffic against other metrics, such as conversions (specific actions you want users to take on your website), you can get a strong idea of how profitable (or not profitable) your search engine advertisements are. Social traffic arrives on a website via links from Facebook, Twitter, and all the other large social media platforms. While they are typically more likely to bounce back to their social media profiles after viewing a page on your website, these users can be very useful in building up your website’s social media profiles. For example, if a large portion of your traffic comes from Twitter, be sure to use the short time they spend on your website to encourage them to follow you on Twitter as well. Direct traffic visits your website by typing the address directly into their browser. It’s great to see a lot of direct traffic because it means that many users are directly interested in your content and not just visiting your website through an intermediary source. At this point we have collected a wealth of information about visitors that arrive on our site. We know who they are, where they come from, and can use that information to make an informed decision about why they are here. However, to get the full picture, we need to know what they do when they arrive on the website as well. This is where the Behavior section comes into play. The Behavior Overview provides information on how users interact with your website. How long did they spend on the site? Which pages did they visit? Where were they when they decided to leave the website? All these questions and more can be answered by the data within this section. The Behavior tab covers how visitors move through your website, which pages they visit (and which pages they don’t), and whether they performed certain actions. Knowing all this can help you make changes to your website that will help direct users along a specific path. The amount of time users spend on a website or webpage can be useful in determining whether or not the site content is engaging users properly. If you have a detailed, 5,000 word article on a page where users only spend an average of 30 seconds, it is likely that users are leaving the page before they get a chance to finish reading. There are a variety of reasons this could happen: the page might be loading too slowly and causing users to abandon it; the article might be too long and boring to finish; or maybe users are clicking on a link in the first paragraph of the post and never returning to finish reading. Whatever the underlying reason, analyzing the time on site plays an important role in finding weak points throughout your website. One of the most useful aspects of the Behavior Overview pane is the ability to see all the previously mentioned metrics for a specific page, rather than for the entire website. Google Analytics makes it easy to find the most popular pages on your website; with this information, you can develop a strategy to push traffic towards those pages and away from pages that do not perform as well. Comparing the most popular pages on your website to the least popular pages helps highlight the strengths and weaknesses of each, allowing you to improve under-performing pages. Behavior Flow will let you view the various paths that users travel when navigating your website on a page-by-page basis. This gives you an idea of which links users tend to click on, and which links typically get ignored. Knowing this, you might add more links on popular pages, encouraging users to delve deeper into the website. Maybe you’d rather ad a few more advertisements to these pages, increasing the opportunities for revenue in the areas that you know get the most traffic. 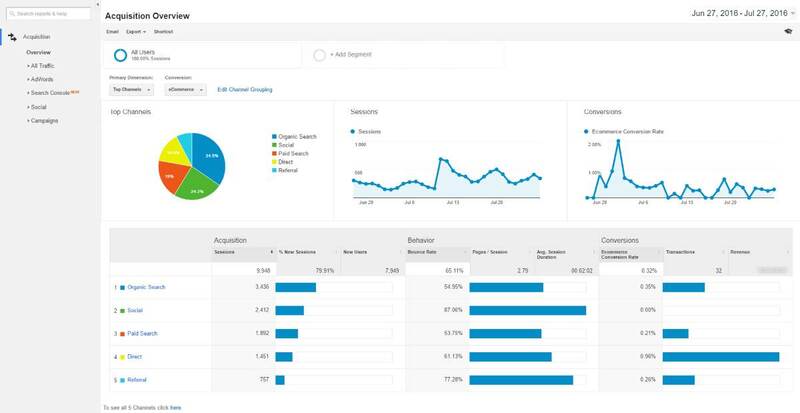 While all of the data metrics collected in Google Analytics can be useful on their own, comparing them against one another is how you can gain key insights into the performance of your website. For example, the differences between organic and social traffic might not become clear until you compare them both against conversion rate, and see that organic traffic converts at a much higher rate than social traffic. Knowing this, you might stop spending money on social media advertisements and instead put that money towards SEO improvements. That change is likely to increase organic search traffic and decrease social traffic, but since organic traffic converts at a higher rate, revenue for the site increases. Analytics provides so many different metrics, the combinations seem endless. However, digging deep into this data is the only way to understand how your site traffic performs, and how to optimize it to improve the performance of your website. Get in touch with us to start your next project.